Science teacher Mike Stannard wanted to incorporate more hands on field based learning for his students at Rutland High School. So last fall, he approached other ninth grade faculty about creating a special unit on maple sugaring. 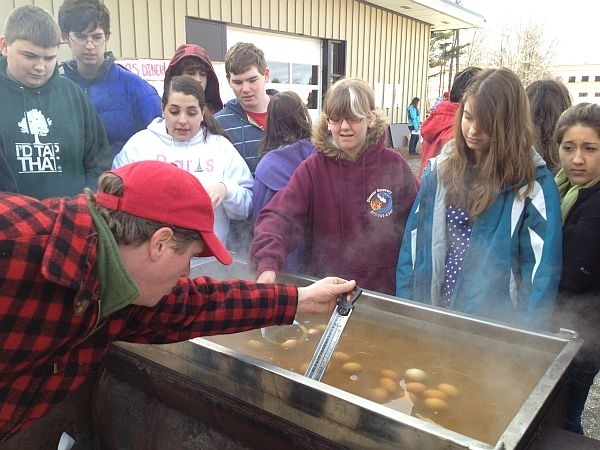 His colleagues embraced the idea and for the last several weeks students have not only been making syrup but incorporating sugaring in everything from theater, music and social studies to math and English. (Mike Stannard) "Good morning, I’m jut stoking the arch here. Before you leave, we’ll have a good steady boil going here and we’ll add some fresh sap. Can somebody tell me why the boiling point of maple syrup is 219 or even sometimes more degrees Farenheit? Why would it be difficult from water I mean boiling is boiling right? (students call out – "There’s more stuff in it. Is it more dense?") Stuff? Like Legos?" (Stannard) "I’m Mike Stanard and I’m an earth science teacher of freshman at Rutland High School and we’re using sugaring as a focal point to learn about all aspects of sugaring and how it affects Vermont and how it was a part of our history and how it should be a great part of our future." (Erin Perry and Shannon Adams) "This is one of our taps. First thing we have to do to make it is we have to drill a hole in the tree and you put it in about an inch and a half. Then you put the tap into the tree. (Perry Adams Knowles) "I’m Erin Perry and I’m in ninth grade. (Shannon Adams) "I’m Shannon Adams and I’m in 9th grade." (Kelsey Knowles) "I’m Kelsey Knowles and I’m in 9th grade." (Knowles) "Yeah, the actual way the bucket is connected to the tap – that was invented right here in Rutland." (Wallstrom) "I’m Erica Wallstrom and I’m an earth sciences teacher here at Rutland High School. That’s the great thing about the project based learning. You start out with the idea that hmmm, maple syrup – it seems like kind of a narrow topic. But as soon as you start to delve into it – it’s like, oh, we can include physics this way and we can include soils this way, and we can include math with line of best fit and we can include a theater production. So it just grows and grows and it becomes kind of a cool celebration of what we’re learning." (Hillary Poremski-Beitzel) "I’m Hillary Poremski-Beitzel and I teach freshmen English at Rutland High School. So when my colleagues approached me about doing this I was excited because I thought immediately of poetry." (Kaleigh Gilbert) "I’m Kaleigh Gilbert." (Taylor Cockey) "I’m Taylor Cockey and we wrote a poem about maple sugaring. We had to use a bunch of different words. They’re very awkward words – we have: winter, bitter, factory milk ,death . We didn’t’ think they’d work but they ended up working very well as a metaphor." (Gilbert and Cockey reading poem) "As winter passes I step on the bitter cold ground. I hear the whisper of the wind, as it speaks the words of slumber giants. I walk the way of a death covered path, to the factory of the sweet amber. I fiddle with the spout of life, and take yet little of the factory’s sweet product. As golden mild flows, to feed my sweet tastebuds, I watch as as the beauty of the hills, falls, into my hands."